This quote best describes our current ecosystem for startups; everyone has the right intentions through events and innovative efforts which appear to be singular in hindsight. If these individual efforts are not collectively directed to the proper channels with the proper messaging, then we miss the opportunity to make a bigger impact. The government has a huge role to play; the corporates have a huge platform to share and create, and all of these are for our “babies” - the startups! The very heart of this ecosystem is an innovative idea and for this ecosystem to succeed, the idea need not come from just one source. Techstars was able to put it in a simple but cohesive way for us to understand. The infographic above shows us the five ingredients that need to co-relate, and cooperate to make a thriving startup ecosystem. This is very much applicable to our Philippines Startup Ecosystem. The good news is, we have key players in each of these pillars, but the bigger conversation is, does each of these players understand where they fit in? Are their efforts directed at a specific part of the ecosystem to benefit the right people? Are they validating their efforts by showing growth in the community? Since 2012, TechTalks.ph has been at the heart of building a thriving startup community in the Philippines. We enjoy doing it; we love seeing startups evolve as the whole spectrum of mentors, government & corporates each take one small step to see ideas transform into products. But as much as we enjoy doing it for years now - WE CANNOT DO IT ALONE. And as much as we want everyone to enjoy what everyone is doing now, the reality still stands the same - NOBODY CAN DO IT ALONE. Working at the grassroots level with the government and private industry (DOST-ICTO, USAID, NICP, Microsoft), TechTalks.ph now has the opportunity to use the lessons we learned as it is being tapped to assist DTI’s SlingshotPH conference, a government event. We do our best to offer advice and share industry best practices. We appreciate working with the small but dedicated DTI team, but ultimately, SlingshotPH is owned and operated by the Philippine government's Department of Trade and Industry. And still, this coming August, TechTalks.ph will conduct our own branded international conference, GeeksOnABeach.com (GOAB). This is our fourth year of bringing “geeks” together in an event initiated by the private industry that is for the community and by the community. GOAB will go to Bohol to continue its agenda of providing a productive playground for geeks. Does that make our efforts redundant? No. Geeks don’t always go to government events, and the government does not always understand geeks. To put it this way, we all went to school. Some may not have finished their degrees but the concept is that the classroom is where the academy trainers and the students collide to discuss, argue, converse on topics that would validate the knowledge. That knowledge is being passed on from one source to another (yes, teachers learn from their students too). But at the end of the day, teachers & facilitators discuss among themselves to design and develop learning methodologies for the students. And, of course, the students have to group among themselves to become better. 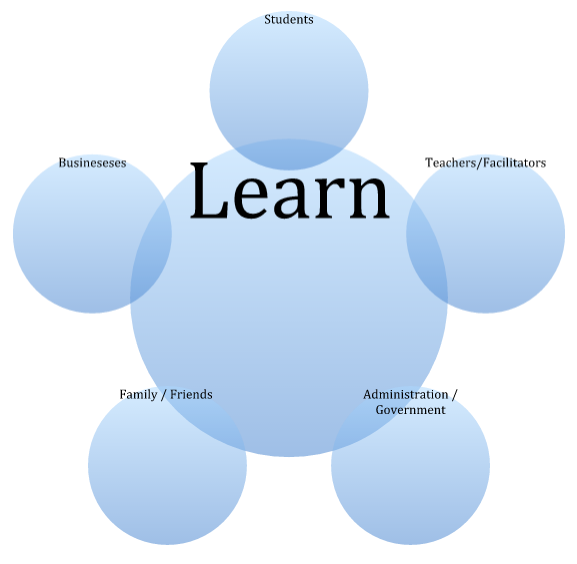 In the modern connected classroom, students also collaborate with facilitators to fuel a circle of individuals educating each other. In any case, another day comes and the students go in the same room as facilitators (be they geeks, corporates, academe, government) so that a classroom (thriving ecosystem) serves its purpose which is to foster a generation of learned individuals. Take away the classroom, what do students do with their lives and who will the teachers design learning methodologies for? 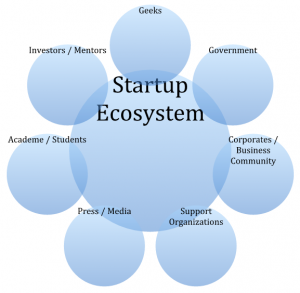 Take away the thriving ecosystem, what do startups do to progress in their journey to profitable business and social change? You would say that education has evolved now because of a more connected world, but still it would require the same pieces of the puzzle for an education system to thrive. DOST-ICTO, through their seedPH, digitalPH and related initiatives, encourages people to "Build Startups", "Become a techie" & "Promote the ICT industry”. DTI, in their “Enabling Business” role, comes in when the product is done, and/or business is already built. So, DTI comes next with "We Accelerate your Startup” & "Help expand your business” agenda through the updated SlingshotPH program. This has to be one journey for the startups; not two separate paths that they have to take. The paths should be complementary not conflicting. We hope that #SlingshotPH will be the platform for the government to connect, listen, influence, legislate with its own agencies and with the ecosystem as well. GeeksOnABeach or SlingshotPH? These are smaller pieces of the puzzle, and we still have a long way to go, but we are definitely on the doorstep of a thriving ecosystem. Together, we are that one voice that would usher the startup community, both mature and budding ones, to achieve its long overdue objectives - sustainable business, social change, innovation, or connectivity. Name it and you have it. No one needs to stop what he is doing, but all needs to speak the right message if everyone wants the startup ecosystem to thrive. TechStars white paper provided by John Beadle Director of Startup Weekend. @Techstars | About Techstars. TechTalks.ph has organized, mentored and attended over 18 Startup Weekend Workshops in the Philippines since 2012. TechTalks.ph - Startup Ecosystem Builder and Innovation Consultant.